More than 30 Sandel Avionics HeliTAWS units will be installed in United Nations helicopters under an agreement announced at the National Business Aviation Association (NBAA) convention and exhibition in Las Vegas, Nev.
Aviation Partners Group (APG) of Punta Gorda, Fla. placed the purchase order for the ST3400H helicopter terrain awareness and warning systems (HTAWS), which it will install on Russian Mil Mi-8/Mi-17 helicopters operated on behalf of the UN. Earlier this year — following the March 9 crash of a UN helicopter in the Democratic Republic of Congo that killed four Russian crewmembers — the UN mandated that all helicopters under contract to the organization be equipped with HTAWS effective Dec. 1, 2013. UN helicopter contracts are dominated by Russian and Ukrainian operators that primarily fly Mi-8/Mi-17 aircraft, and APG holds exclusivity on the connector for the Sandel ST3400H HeliTAWS for this helicopter type. Currently, two APG Russian engineers are installing ST3400H units on helicopters in Congo, Nepal and Ivory Coast. APG said it will complete installations of the HeliTAWS units by the end of the year. Based on Sandel’s ST3400 Class A TAWS for Federal Aviation Regulations Part 25 aircraft, the ST3400 was designed specifically for helicopters, and exceeds the HTAWS requirements of Technical Standard Order C194. 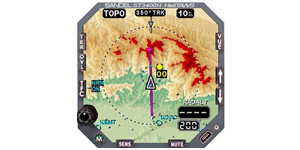 Sandel’s HeliTAWS is also renowned for its proprietary “WireWatch” database, which alerts pilots to known wires in the area. That’s a feature that may not be available in many of the UN’s operating areas: according to Sandel spokesperson Reb Risty, while Sandel obtains global obstacle and terrain data from Jeppesen, growing the WireWatch database is an ongoing effort that involves working with partners including foreign governments. Risty said that Sandel is currently working through partners in Japan, Korea and Russia to enhance its offering.